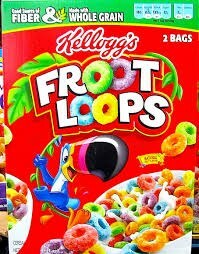 Froot Loops is a brand of sweetened, fruit-flavoured breakfast cereal produced by Kellogg's and sold in many countries. The cereal pieces are ring-shaped (hence "loops") and come in a variety of bright colours and a blend of fruit flavours (hence "froot"). Kellogg's introduced Froot Loops in September 1962. Originally, there were red, orange, and yellow loops, but green, purple, and blue were added during the 1990s.